Coronilla varia is a perennial herb with creeping stems that may reach 0.6 - 2 metres. It is tolerant of drought, heavy precipitation, and cold temperatures, but it is intolerant of shade. C. varia is adapted to all coarse and medium textured soils, but it does not grow well in fine textured, saline, and alkaline soils. It reproduces prolifically and spreads rapidly via creeping rhizomes. In the United States C. varia has been extensively planted for erosion control along many roads and other disturbed areas. It has also been widely planted for ground cover on steep banks, mine reclamation, and as a cover crop on cropland. VDCR/VNPS (UNDATED) describes C. varia, a member of the pea family, as a perennial herb with creeping stems that may reach 0.6 - 2m in length. The compound leaves bear 15 to 25 leaflets. 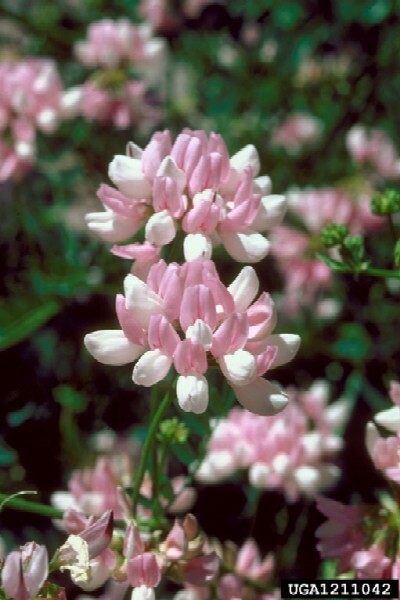 The pea-like, pink to white flowers occur in clusters at the end of extended stalks. The narrow, leathery seedpods may be 5 - 8cm long. The following three characteristics together distinguish C. Varia from other legumes: its compound leaves have an odd number of leaflets, the leaves and flower stalks arise from the main stem, and the flowers occur in a radiating cluster called an umbel. Coronilla varia will typically have a large seed bank stored in the soil, and seeds do not require a period of cold stratification to germinate (Tu 2003). Seeds remain viable in soil for less than a year to 5 years (USGS 2002). Tu (2003) reports that in the United States, C. varia has been extensively planted for erosion control along many roads, highways, and disturbed areas. It has also been widely planted for ground cover, mine reclamation, and as a cover crop as it provides nitrogen to soil through its association with cyanobacteria. It produces high quality forage for livestock. While it can be poisonous to single stomached animals if ingested in large quantities, there is generally little or no bloat hazard to other livestock. Deer and elk eat C. varia, and rabbits, ground-nesting birds, and meadow voles often use it as cover. Caterpillars and butterflies may use it as a host plant. Tu (2003) describes Coronilla varia as tolerant of a broad range of environmental conditions. It can withstand periods of drought as well as heavy precipitation (up to 165cm annual precipitation), but it cannot tolerate flooded soil conditions. It is tolerant of cold temperatures (down to –33°C) but is intolerant of shade. C. varia is well adapted to all coarse and medium textured soils, including sands, gravelly-rocky soils, and loams. It does not grow particularly well in fine textured soils, but can survive in silts and clays. It can grow in soils ranging in pH from 5.0 to 7.5 and is not tolerant of saline and alkaline soils. Since C. varia was largely planted in the United States for erosion control, it is now located mostly along roadsides, rights-of-way, open fields, waste areas, and on gravel bars along streams. Coronilla varia reproduces vegetatively by rhizome sprouts and sexually via the production of seeds (Tu 2003). The number of seeds per plant is 11-1000, and the frequency of sexual reproduction for a mature plant is once a year (USGS 2002). Coronilla varia can grow in soils of low fertility. 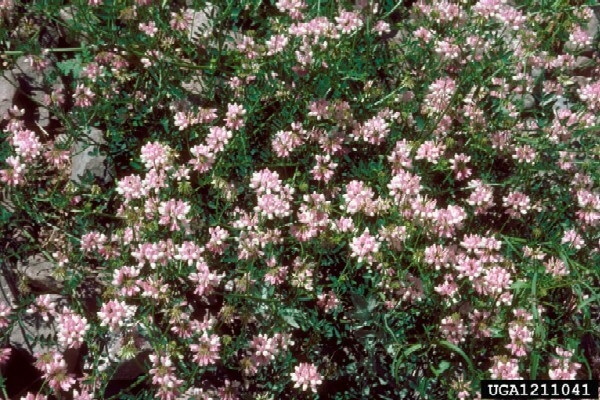 Coronilla varia was introduced into the United States for use in erosion control along highway embankments (VDCR/VNPS UNDATED).It is planted as a green fertilizer crop (VDCR/VNPS UNDATED). Tu, M. 2003. Element Stewardship Abstract for Coronilla varia L.. The Nature Conservancy. Recommended citation: Global Invasive Species Database (2019) Species profile: Coronilla varia. Downloaded from http://www.iucngisd.org/gisd/species.php?sc=276 on 22-04-2019. 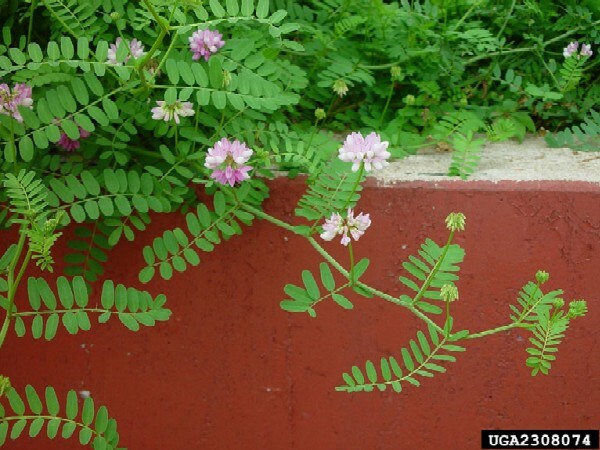 Tu (2003) states that Coronilla varia can invade and dominate avariety of vegetation types. It is a serious threat to many natural areas because of its prolific seeding ability and rapid rate of vegetative spread via its rhizomes, which can create dense, single-species stands. The character of a natural area can be transformed from a richly diverse habitat into just another weedy tract (VDCR/VNPS UNDATED). Tu (2003) reports that when plant communities become thoroughly infested, native plant biodiversity decreases and natural successional processes are altered. It is able to competitively reduce and/or exclude the growth of most native plant species (primarily by shading), such as the native rare plant Solidago shortii in the southeastern United States. By excluding native plants, wildlife that rely on natural habitats and communities are then compromised. C. varia can alter ecosystem function and nutrient cycling, leading to further degradation of those infested habitats. When C. varia invades new habitats, soil nitrogen increases (roots fix nitrogen with symbiotic cyanobacteria) and overall fuel load changes in fire-adapted communities. C. varia can be poisonous to single stomached animals if ingested in large quantities. Integrated management: According to Tu (2003), the best management approach for C. varia is probably an integrated one. To obtain desired results, it may be necessary to employ manual and mechanical methods along with another control treatment, such as a herbicide spray to control seedlings, repeated for several years and followed by active restoration efforts. \r\nPhysical: Manual or mechanical methods of plant removal can control C. varia in small, isolated patches. These methods, however, are very time and labor-intensive because all pieces of the roots, must carefully be removed to avoid resprouting. Populations must be monitored for several years following plant removal because seeds stored in the soil seed bank may germinate for up to 10 years. Cutting or mowing at a frequency of less than once per year is not effective at controlling populations, but does offer a method for temporarily stopping or slowing its spread. Mowing around the periphery of the desired vegetation (natural area) will keep it from spreading into the area vegetatively, but does not prevent the arrival of seeds. Cutting or mowing removes standing biomass only, so spray herbicides have higher efficacy. Grazing can be used in combination with an herbicide treatment for control. \r\nChemical: Herbicides are currently the most effective means to control large infestations. Herbicides can be applied with either backpack sprayers (to minimise overspray) or with a boom. Dicamba, 2,4-D, glyphosate, triclopyr, or clopyralid may be used, and 2,4-D (amine or ester) or Glyphosate applied as a 1% or 2% solution can be foliar-applied for good control when C. varia is actively growing. A 2% solution of triclopyr kills 99% of C. varia in large infestations. Clopyralid is a more target-specific herbicide than glyphosate, 2,4-D, or triclopyr, and a 0.25% solution of clopyralid with 0.5% surfactant can kill up to 100% of C. varia cover. All of these herbicides are active on most other native and non-native broadleaved species (dicots) and glyphosate is active on all species (monocots and dicots). Multiple applications will be required over a period of several years since dormant crownvetch seed can regenerate the stand for up to ten years after elimination of the live plants. Crownvetch is tolerant to imazethapyr, imazapic and many other herbicides. Informations on Coronilla varia has been recorded for the following locations. Click on the name for additional informations. Summary: Detailed report on description, habitat, distribution, reproduction methods, uses, and control. Virginia Department of Conservation and Recreation and Virginia Native Plant Society (VDCR/VNPS), UNDATED. Invasive Alien Plant Species of Virginia: Crown Vetch (Coronilla varia L.). Ohio State University (OSU). UNDATED. 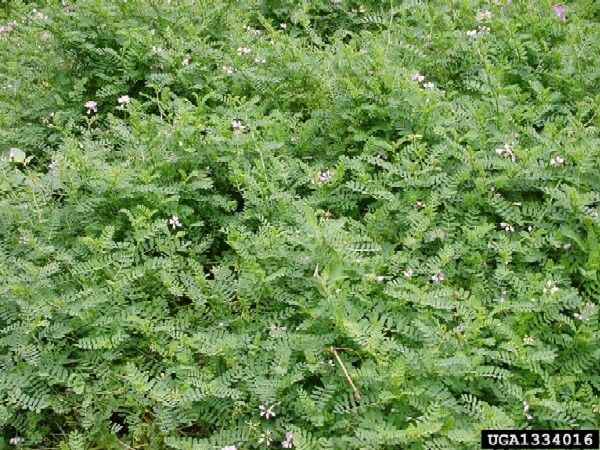 Ohio Perennial & Biennial Weed Guide: Crown vetch, Ohio Agricultural Research & Development Center, Ohio. Summary: Brief summary on description, distribution, habitat and similar species. USGS (United States Geological Survey). 2002. Southwest Exotic Plant Information Clearinghouse. Colorado Plateau Field Station. Summary: Very brief account on dispersal methods, germination requirements, no. of seeds per plant, etc. Wilcox, M. D. 2003. Coronilla varia. In PlantWorld - a compendium of plants of the world. Mangere Bridge, Auckland, New Zealand (unpublished).